Penn Charter School baseball player Mike Siani throws during a practice at the East Falls school. All Mike Siani can do now is sit back and wait. 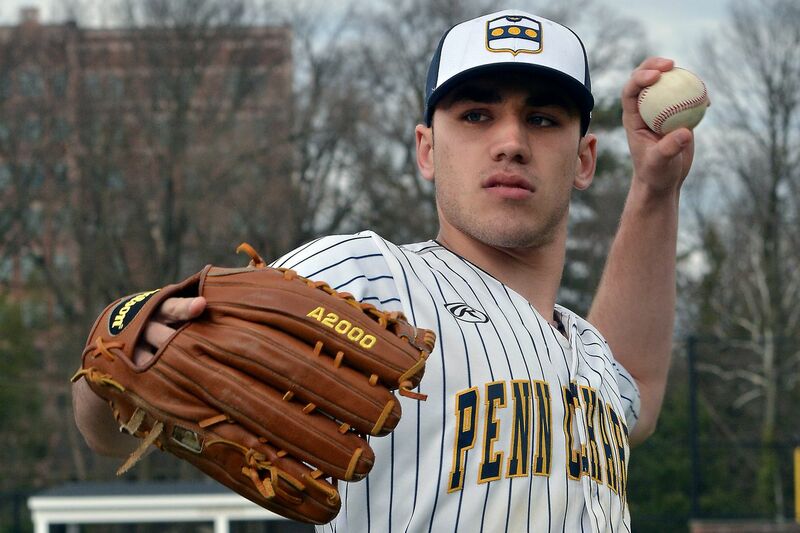 The standout centerfielder from Penn Charter could be selected in the early rounds of the Major League Baseball draft that begins Monday. "When it comes down to it, you really never know what's going to happen," Siani said. "I'm not nervous about anything. I'm just going to watch the draft from home with my family and see how things play out." The 6-foot, 190-pound lefthander worked out for the Kansas City Royals on Wednesday, the Milwaukee Brewers on Thursday, and the Boston Red Sox on Friday. "I think I did well at all three places," Siani said, "but the teams never give you much feedback afterward. They just thank you for making the trip." Of working out for the Red Sox at legendary Fenway Park, Saini said, "That was exciting. Being there makes you think about some of the all-time greats that have played at Fenway since it was built in 1912." A hard-hitting and speedy leadoff man who covers a lot of ground in the outfield, Siani was named Gatorade state baseball player of the year on Tuesday. Penn Charter's Mike Siani dives for a ball hit by a Malvern Prep player last season. Siani batted .361 with 25 runs scored, 19 stolen bases, five doubles, two homers, and 11 RBIs in his senior season. He had a .509 slugging percentage, a .495 on-base percentage, and a 1.002 OPS. A two-year member of USA Baseball's 18-and-under national team, Siani batted .405 in Inter-Ac League action. The Glenside resident received in-home visits from 28 of the 30 major-league clubs. He is being advised by New York's Excel Sports Management, which counts three-time Cy Young Award winner Clayton Kershaw and Pittsburgh Pirates outfielder Corey Dickerson among its clients. If Siani does not get drafted or cannot reach a contract agreement with a club that picks him, he will report to the University of Virginia on July 12. He committed to the Cavaliers in his freshman year at Penn Charter. "I'm excited about the opportunity to play at Virginia," he said. "It's going to take a lot for me not to go to college." For those wondering, Mike's father, Ralph, is a distant cousin of former Villanova and Oakland Raiders wide receiver Mike Siani. A least six other seniors from Southeastern Pennsylvania schools have a shot at being selected in this year's draft. Malvern Prep ace Billy Corcoran has committed to play at Pittsburgh. The list includes five hurlers: Malvern Prep's Billy Corcoran and Brady Devereux, both University of Pittsburgh recruits, Archbishop Carroll's Jake Kelchner (Alabama), Downingtown West's Drew Britt (West Virginia), and Oxford's Luke Rettig (Lehigh). Also in the mix is La Salle catcher Andrew Cossetti, a St. Joseph's recruit who has received in-home visits from the Phillies and Dodgers. The 6-foot, 220-pounder is batting .478 with 30 runs scored and 33 RBIs. Neumann-Goretti (14-5) will take on Dock Mennonite (19-4) in a PIAA Class 2A first-round matchup at 4 p.m. Monday at North Penn. N-G edged Dock, 4-3, in a state opener last season and the Saints went on to claim their second straight title with a 7-4 victory over District 6's Bishop McCort. Neumann-Goretti's Aidan Baur scores on a passed ball around Dock Mennonite third baseman Nolan Bolton (11) in a PIAA Class 2A state playoff game last year. N-G has been sparked at the plate this season by centerfielder Colin Eiser, shortstop Aidan Baur, first baseman R.J. McGettigan, and lefthanded pitcher and designated hitter Joe LaFiora. Dock has been led on offense by shortstop Nolan Bolton, third baseman Brody Moyer, second baseman Mason Fisher, leftfielder Dylan Rush, and first baseman Mike Moyer. The Pioneers are guided by first-year head coach James Smith, who spent the last three years as an assistant at Quakertown.